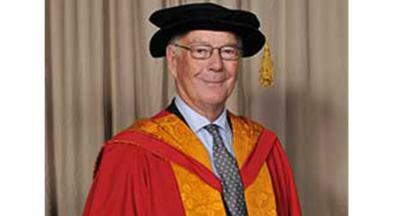 The Chairman of the Black Country Living Museum Trust has received an Honorary Degree of Doctor of Business Administration from the University of Wolverhampton. John H. Hughes has been recognised for his impressive record in the field of finance and general management and his role as Chairman of the Museum. He received his award from the Faculty of Social Sciences at a ceremony at Wolverhampton Grand Theatre on Thursday September 4. In 1967, John qualified as a Chartered Accountant with the now PricewaterhouseCoopers in Birmingham. In 1970 he joined GKN initially at Joseph Sankey and Sons Ltd at Bilston and then moved to GKN Vandervell. He later transferred to the group centre as Head of Corporate Finance with responsibility for implementing acquisitions and divestments in support of the strategic repositioning of GKN businesses. He also held divisional chairman roles and represented the group as a director of joint ventures with Brambles and British Steel. Also responsible for central procurement, he retired as group Deputy Finance Director in 2003. John is currently Chairman of the GKN Group Pension Scheme 2012 and also chairs the investment committee. Chairman of the Black Country Living Museum Trust since 2006, John has been engaged with the Museum Director in the strategic development and repositioning of the Museum, which has achieved designation of its entire collections by Arts Council England and been awarded significant grants to assist in its development. He also holds roles in other charities and undertakes strategic and financial consultancy. John is married to Carol with two sons, Jeremy and Adam and five grandchildren and his interests include museum and charity development, business and stock markets, his growing family and maintaining a Georgian rectory and its surroundings.